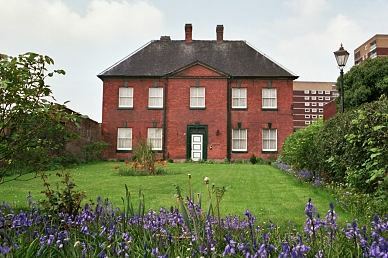 Tamworth's first workhouse was built in 1741 by the Earl of Northampton on a site now occupied by Yate's Wine Lodge. Tamworth had a parish workhouse at Ladybridge Bank, erected in 1750 for the poor of the town by Thomas, Lord Viscount Weymouth, and Francis, Lord Middleton. A parliamentary report of 1777 recorded parish workhouses in operation in Tamworth (for up to 80 inmates) and at Wigginton (15 inmates). Counties of Warwick and Stafford: Tamworth (4). County of Warwick: Amington and Stony Delph, Anstrey, Bolehale and Glascote, Kingsbury (2), Middleton, Liberty of Tamworth Castle, Newton Regis or Newton-in-the-Thistles, Seckington, Shuttington, Wilnecote. County of Stafford: Clifton Campville, Drayton Bassett, Edingale, Fazeley (2), Harlaston, Hints, Statfold, Syerscourt, Thorpe Constantine, Wigginton. The population falling within the union at the 1831 census had been 12,175 with parishes ranging in size from Syerscourt (population 34) to Tamworth itself (3,537). The average annual poor-rate expenditure for the period 1833-35 had been £6,249 or 10s.3d. per head of the population. According to the 1851 White's Directory of Staffordshire, the Tamworth Union workhouse comprised "two adjacent buildings in the same enclosure, one of which was built in 1837-8, and the other is the old Parish Workhouse... This is larger and hansomer than the new part, and has the appearance of a comfortable and well-built hospital. The two buildings have room for about 120 paupers." Presumably, the existing buildings were insufficient for the union's requirements, and in 1858-9 new union workhouse was erected on the west side of Wigginton Road in Tamworth. The new building was officially opened on 8th June, 1859. The architects were Messrs Briggs and Everall of Birmingham who were also responsible for the workhouse at West Bromwich. The building was Gothic in character and was built of brick with stone dressings. The entrance block at the south incorporated a central archway and contained a porter's lodge, waiting room, board room, and clerk's office. Immediately behind this were the Master and Matron's quarters. The main accommodation building adopted a cruciform plan with separate wings for the different categories of inmate. The north wing included a combined chapel and dining hall. The children had their own school-rooms, dining hall and playgrounds away from the adults. There was also a small hospital with separate fever wards. A new hospital block was erected at the west of the workhouse in 1904. The ground floor contained a kitchen, nurse's sleeping room, patients' day rooms, and sleeping rooms for the infirm. The upper floor contained a male ward, female ward, and a ward for special cases. It was designed with windows placed between the beds, and opposite one another at each side of the building to allow through ventilation. The building work cost £998.14s. The site layout from around 1922 is shown on the map below, by which time the workhouse had become known as Tamworth Poor Law Institution. The workhouse later became St Editha's Hospital but closed in 1998. The site has been developed for residential use and the majority of the workhouse buildings demolished. However, the 1904 hospital block survives. Tamworth 1904 hospital block, 2000. Lichfield Record Office, The Friary, Lichfield, WS13 6QG. Holdings include: Guardians' minute books (1836-1930); Admissions and discharges (1836-1930); Births (1837-19235); Deaths (1836-1949); Creed register (1912-23); Punishments (1868-1914); etc.